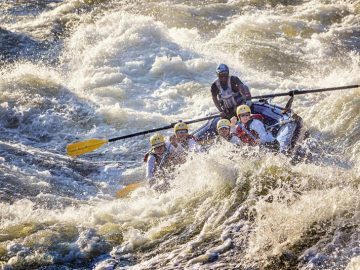 We can always tell when it’s going to be a memorable whitewater season at OARS. There’s buzz about snowpack numbers, of course, but come March, a steady stream of boxes from NRS and Kokatat, filled with high float PFDs and dry suits, start arriving at headquarters for our guides. This is one of those years. Thanks to a higher-than-average snowpack across the western U.S., outfitters are expecting the biggest water we’ve seen since 2011, especially in California, which just two years ago, was under severe drought conditions and experienced its worst snowpack in nearly 500 years. With a massive snowpack across the Sierra, California whitewater is expected to be the best it’s been in nearly a quarter century. 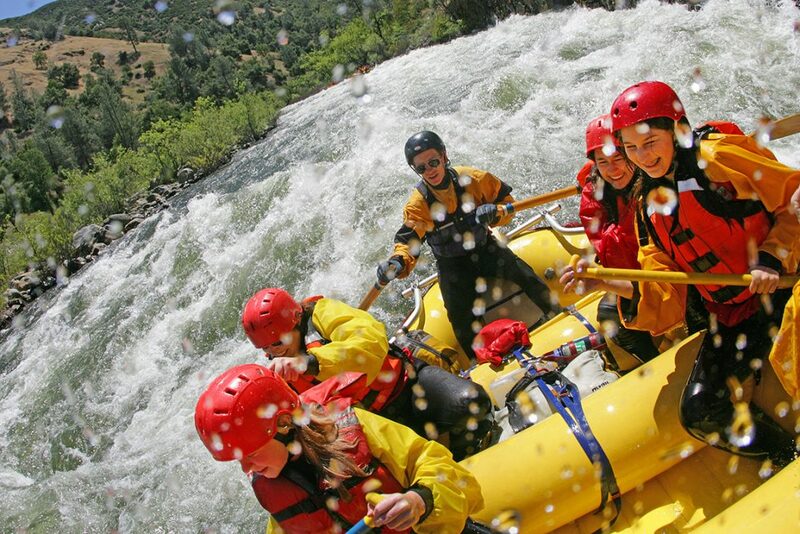 Rafters should be prepared for high water rafting conditions that will likely last into early July on many popular rivers, including the South Fork of the American, North Fork of the American, Tuolumne River and Merced. Additionally, the North Fork of the Stanislaus, a guide-favorite, should be in play from April – early June this year. It’s the rare opportunity to run one of California’s whitewater gems. It’s best case scenario for Idaho rivers this season where the snowpack data shows more water and more coverage than the previous five seasons. High-water trips are expected on the Main Salmon and Snake River in May, and on the Middle Fork of the Salmon into June. More consistent flows will continue on these rivers throughout the summer. 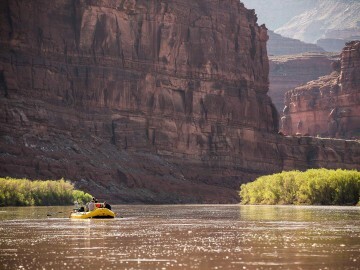 Once-in-a-decade conditions are anticipated on the Green River through the Gates of Lodore and on the Colorado River through Utah’s Cataract Canyon. The weather in April will determine exactly what will play out, but this season is being likened to other record-setting high water years, most recently in 2011. 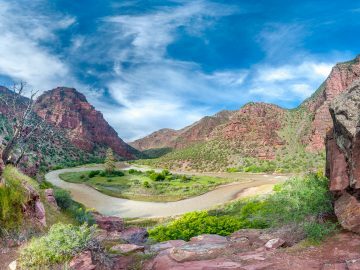 On the other side of the spectrum, families looking to go rafting before July should look to Utah’s incredibly scenic San Juan River. While high-water conditions will keep younger kids off many rivers in the West until flows return to normal, the family-friendly San Juan will be great for kids, even during high water when the minimum age is 7. There’s no question that 2017 will be a memorable rafting season. 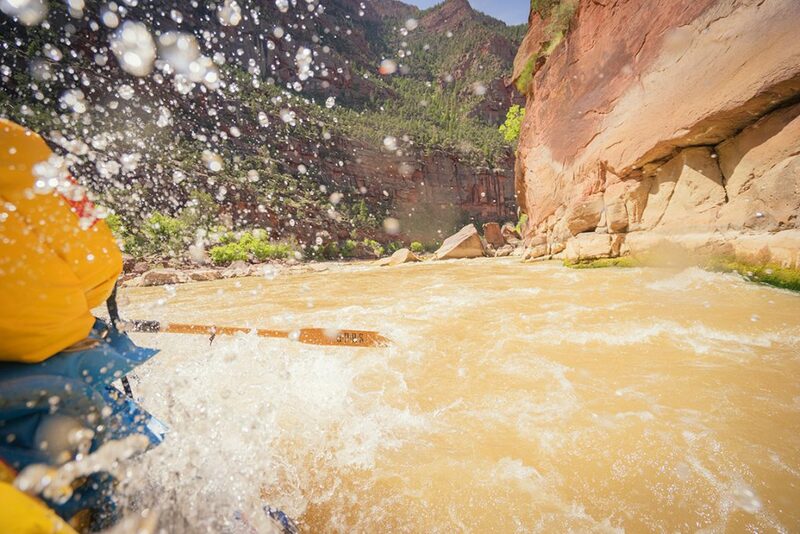 Following is additional insight on some of the West’s most popular whitewater trips. California hasn’t received this much snow since 1993, which means whitewater rafting outfitters anticipate the best and most exciting river conditions in 24 years. As of the end of March, the California Department of Natural Resources reports the statewide snowpack at 175 percent of normal. That means rafters should be prepared for high-water rafting conditions across the board into late June, and possibly early July. Beginning April 1, commercial rafting trips on the American River near Sacramento will start hitting the water. 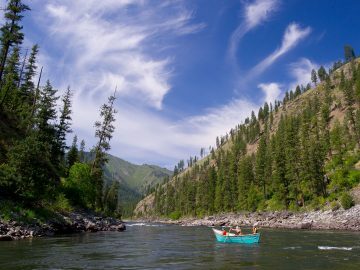 On the popular South Fork of the American, which is typically a fun, family-friendly Class III trip, flows are expected to run high through June. 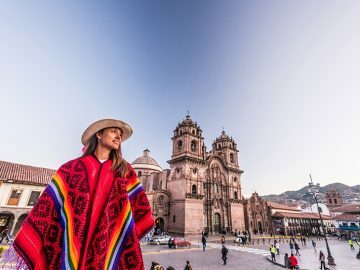 For people who’ve done this trip in the past, it’s an opportunity to experience this stretch of river at a whole new level. “Where we typically see flows right around 1,500 cubic feet per second (cfs), there’s a good chance we’ll see that corridor go up to 15,000 cfs, which is 10 times our normal flows,” says Chris Moore, California Regional Manager for OARS. That means for families with kids under the age of 12, this summer it will be best to plan South Fork trips from July – September when flows are expected to return to normal. Because of California’s massive snowpack, Moore also points out that it’s a great year to catch epic, but often finicky Class IV+ adventures like the North of the Fork American and the North Fork of the Stanislaus which flows through Calaveras Big Trees State Park. While weather will dictate the exact windows for these trips, he anticipates the North Fork American will run through the last week of June while the North Fork Stanislaus is looking like it will be prime in April with flows anticipated through the first week of June. 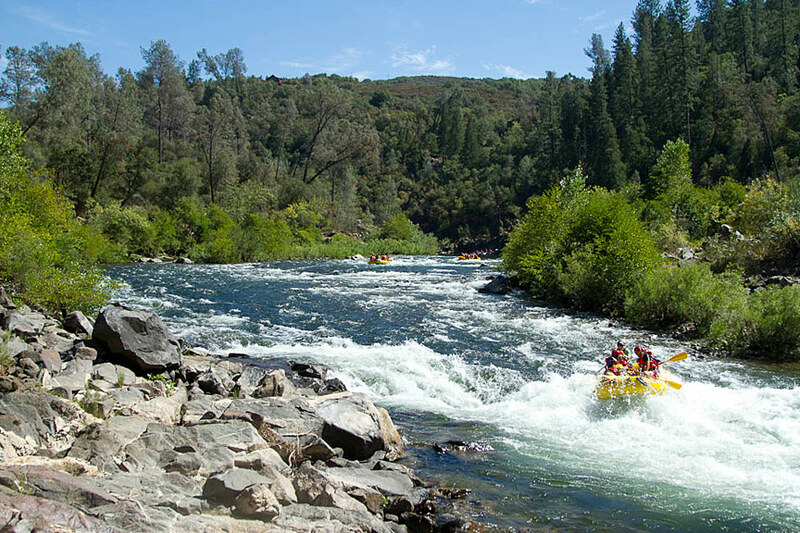 On the Tuolumne River—the state’s iconic Class IV rafting trip just outside of Yosemite National Park—it’s going to be rollercoaster season with trips running April – September. Moore says the current snowpack is going to allow rafters to see the Tuolumne River anywhere from the fun and fluffy 3,000 cfs to the “hold onto your hats, we gotta make this move” levels of 8,000 cfs or higher. The free-flowing Merced River, another river flowing from Yosemite National Park, is expected to run April through July this season. During peak flows, which should last through June this year, the Merced turns into a classic big-water trip with Grand Canyon-sized wave trains. The rest of the season, this Wild & Scenic river turns into a more moderate trip full of fun, rollicking Class III-IV rapids. In the Southern Sierra, where the snowpack is at an ample 164% of normal, outfitters on the Kern and Kings Rivers are expecting a banner whitewater year that lasts well into the summer. This comes as much relief after several years of extreme drought. 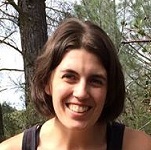 Like the rest of the West, Oregon saw an above-average snowpack across the state, but it’s business as usual on Oregon’s dam-controlled Rogue River, according to Kate Wollney, OARS. Oregon Regional Manager. 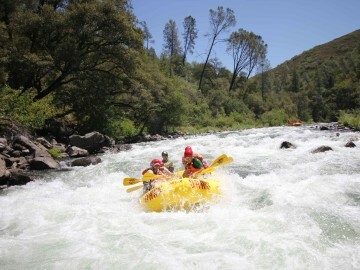 The Rogue is a wilderness river trip that families with children as young as age 7 can count on May through September. 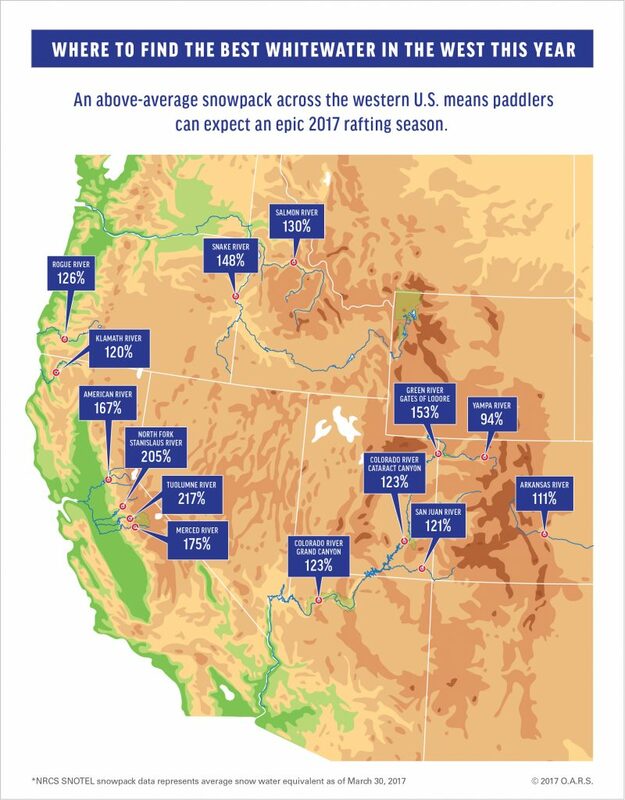 Idaho’s snowpack is above average across the state, which means it’s best case scenario for whitewater trips on the Salmon and Snake Rivers. According to Curt Chang, OARS. Idaho Regional Manager, this year’s snowpack has brought the best overall coverage in five years and guarantees consistent flows throughout the summer months. Thrill seekers, he notes, will see some exceptional big water conditions on the Salmon River this season but warns runoff will come early. “Current weather forecasts call for continued warming which will bring crazy high flows earlier in April and May for the Salmon River,” says Chang, who predicts peak flows as high as 75,000 cfs. On the Middle Fork of the Salmon, high water and big rides will be the name of the game through June, he adds. Since spring runoff is expected to be plentiful this year, the dam-controlled Snake River will also see higher flows early on with normal flows likely returning by the end of May. 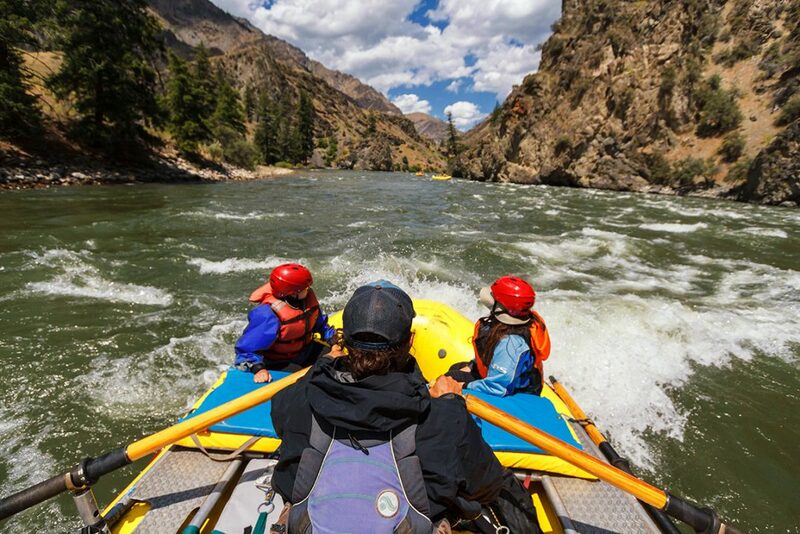 With a snowpack that’s 110% of normal, Colorado’s Arkansas River, which offers one of the state’s best whitewater opportunities for single and multi-day trips, is poised for a solid season. 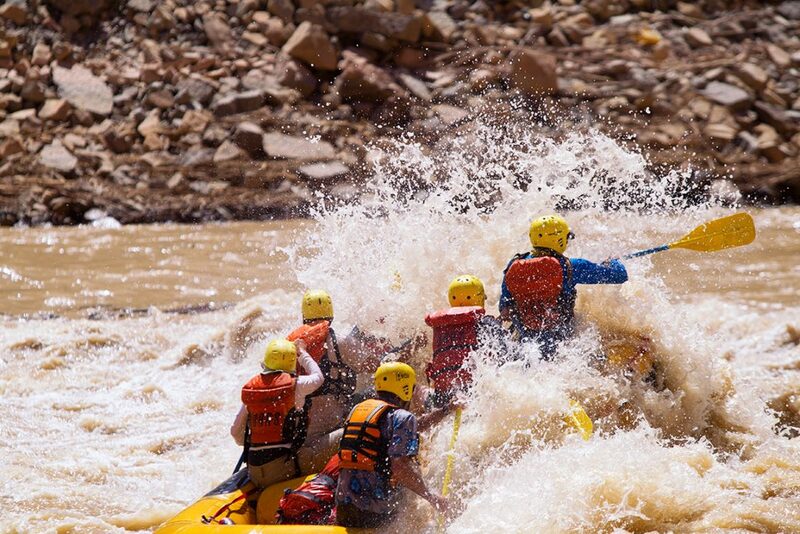 The last time there was this much hype about Utah’s rafting season was 2011. That season the snowpack in the Upper Colorado River Basin measured at 147% of normal. While not quite the record-setting year, current SNOTEL snow/precipitation data shows a snowpack that’s 110% of normal, which means high water is definite on the Colorado River through Cataract Canyon from mid-May to mid-June. According to Seth Davis, OARS. Canyonlands Manager, we could be looking at peak flows in the 50,000 cfs range by late May. While that prediction is based on data from the Colorado River Forecast Center, just how exciting the peak flows will be, and when, ultimately will be determined by the upcoming weather cycles. Meanwhile, the Westwater Canyon stretch of the Colorado River will likely be out of play early season this year since high-water flows through early June are expected to flush out many of the main rapids. Following peak water levels, though, this popular trip should have great flows well into the summer, reports Davis. In the Green River Basin, rafters will see bigger-than-normal conditions on Split Mountain and Gates of Lodore rafting trips thanks to a record snowpack that’s measuring 153% of normal. “Current snow pack for the Green river is the highest on record,” according to Bruce Lavoie, OARS. Dinosaur Regional Manager. “We expect high flows in Lodore and Split Mountain, and a longer high-water season from May into July.” After peak flows, lower family-friendly flows will continue into September. 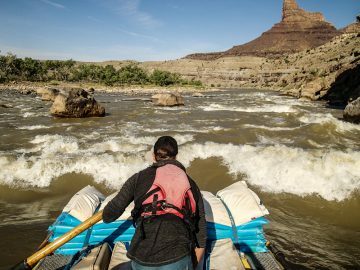 Further south, the Green River through Desolation Canyon should also see exciting early-season flows with sustained water late into the summer. For the Yampa River, which has a slightly below-normal snowpack this year at 94%, Lavoie says to expect an average high-water season that runs from mid-May to mid-June with sustained flows into July. Meanwhile, an above-average snowpack in southeastern Utah also means the family-friendly San Juan River is expected to have a longer season this year. 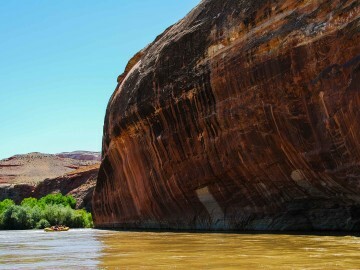 Families with younger kids who are looking to get on a river trip earlier in the summer during peak flows, can rely on this scenic trip located on the border of Bears Ears National Monument. The Colorado River in the Grand Canyon is regulated by Glen Canyon Dam. That said, with higher-than-average snowpack numbers in the Colorado River Basin this season, boaters may see some elevated spring flows. 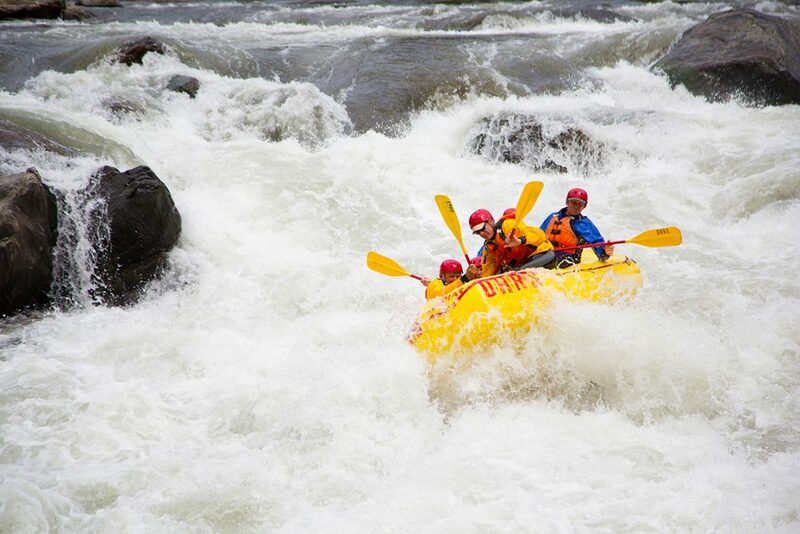 For the highly adventurous, there’s nothing quite like an early-season high-water rafting trip. 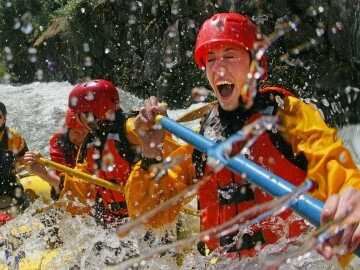 But if the idea of going for a cold and lengthy involuntary swim or self-rescuing (aggressively swimming to a nearby raft or shore) makes you nervous, then a high-water rafting trip might not be a good fit. Families and people looking for a fun, but more leisurely pace this year should consider planning rafting trips from July through September when river flows across the West should return to normal flows. Or, look to rivers like the Rogue, Lower Klamath, San Juan and the Snake River through Hells Canyon.